To begin with thank you to all of you who commented on CIELAP's draft Strategic Plan. The emails and the substantive comments you sent have given us a lot of valuable feedback to consider. Please stay tuned - we're making revisions and we'll be sending out a final version of the Plan soon. CIELAP is in a time of transition. As many of you know, Anne Mitchell left CIELAP at the end of June after 17 years of leading the organization as Executive Director. The CIELAP staff and board would like to extend their sincere appreciation for Anne's long commitment to CIELAP and to the mission it serves. Anne, we'll certainly miss you. We now welcome Tom Esakin, who joined CIELAP as its new Executive Director in August. Tom brings a strong background in sustainable development to the position as well as his experience as Executive Director and Director of Development for JUMP Math; Inaugural Executive Director for the Clayoquot Biosphere Trust; and senior aide and policy advisor on Parliament Hill. We encourage you to learn more about Tom. In our 2006 report There is No AWAY, CIELAP made the recommendation to phase out the use of antibiotics and growth hormones as animal growth promoters and to review the use of preventive antibiotics in animal feed for eventual phase out. CIELAP’s new report Reducing and Phasing out the Use of Antibiotics and Hormone Growth Promoters in Canadian Agriculture discusses implementing this recommendation in light of both the European experiences and other factors specific to Canada’s situation. This chapter, authored by CIELAP researchers Satya P. Mohapatra and Anne Mitchell in the publication Trade Policy in Globalizing World (ISBN: 978-1-60456-830-1) highlights the need for international cooperation to effectively regulate global mercury trade. Download the chapter from the CIELAP website. 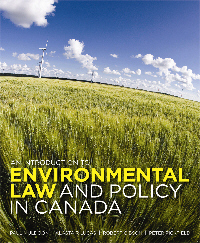 In An Introduction to Environmental Law and Policy in Canada, published and sold by Emond Montgomery Publications, authors Paul Muldoon, Alastair Lucas, Robert Gibson, and Peter Pickfield offer a comprehensive look at current laws and policies governing Canada’s environment and natural resources. CIELAP would like to once again thank the authors for passing on the book's royalties to CIELAP. The book can be purchased from Emond Montgomery Publications. Since March 2009, CIELAP has prepared seven briefs to inform the public about recent policy developments on the issues of: biosolids management, the Federal Sustainable Development Act, life cycle assessment, Ontario's Toxics Reduction Act, nanotechnology and metals, sustainable consumption and production and Ontario's Green Energy and Green Economy Act. The purpose of the Federal Sustainable Development Act (FSDA), which was passed in June 2008, is to provide a legal framework for the development and implementation of a Federal Sustainable Development Strategy intended to make environmental decision-making more transparent and accountable to Parliament. CIELAP’s brief provides a description of the Act, notes the government’s progress in developing a Federal Sustainability Development Strategy, highlights examples from European jurisdictions, and provides recommendations for Canada. Each year Ontario generates approximately 300,000 dry tons of municipal sewage biosolids. About 40% are applied to land, 40% go to landfills and 20% are incinerated. Increasingly, municipalities are pursuing land application as a means of disposal. Some stakeholders have recognized biosolids as potentially useful soil amendments while others have expressed significant concerns about their application to agricultural land. CIELAP’s brief provides a description of biosolids; outlines the regulations governing their use in Ontario; summarizes stakeholder perspectives; and provides CIELAP’s recommendations on the issue. In October 2008 the Ontario government began broad public consultation for its 5-year review of Ontario's Waste Diversion Act (WDA). On October 28 2009 Ontario's Minister of the Environment released From Waste to Worth: The Role of Waste Diversion in the Green Economy, a report on the review of Ontario's Waste Diversion Act, and launched a public consultation process that will end January 11 2010. CIELAP commends the government on its strong proposed waste framework. We also encourage readers to access CIELAP's Options Paper and background papers on the review of Ontario's Waste Diversion Act, released in February 2009, for more about the Act and what we heard from stakeholders during our own independent review. On October 6 2009, Gord Miller, the Environmental Commissioner of Ontario, released his Annual Report for 2008-2009. The report highlighted the importance of incorporating the concept of resilience into sectors such as planning, the protection of biodiversity and resources, and infrastructure. Resilience refers to the ability of ecological and socio-economic systems to withstand disturbance or disruption. The Commissioner’s report also highlighted nanotechnology as a developing issue that has the potential to bring about significant environmental impacts and that deserves increased government attention. CIELAP was very pleased to see each of these issues addressed and we encourage readers to access our 2007 and 2008 Discussion Papers on the emerging area of Nanotechnology as well as the conference proceedings from our November 2008 workshop Achieving Resilient Agricultural Systems . On August 6th 2009, Canada's Minister of the Environment Jim Prentice announced proposed new regulations for municipal water management that will include national performance standards, timelines, and monitoring and reporting requirements. The regulations, to be developed under the Fisheries Act, follow the Government’s commitment to implement the Canadian Council of Ministers of the Environment Municipal Wastewater Strategy. Visit Environment Canada to read more about the Action Plan for Clean Water. On May 28, 2009 the Ontario Government proposed amendments to the Technical Standards and Safety Act (TSSA). The amendments are intended to increase transparency and accountability of the Act and to improve the technical safety system in Ontario. Under the proposed amendments, the Auditor General now has access to TSSA’s records and the authority to conduct audits in addition to those required under the Corporations Act. Some of the amendments made are directly in line with recommendations made by CIELAP in its report The New Public Management Comes to Ontario: A study of Ontario's Technical Standards and Safety Authority and the impacts of putting public safety in private hands (2000). For more information on the TSSA Amendments visit the Ontario Government's website. Regulation to Include First Nations’ Drinking Water Systems in the Drinking Water Source Protection Planning Process Pursuant to the Clean Water Act (EBR Registry # 010-7903) – The Ministry of the Environment is seeking public comment on proposals by the Kettle and Stony Point First Nation and the Six Nations of the Grand River to include drinking water on the reserves in the source protection planning process. Comments will be accepted until November 20 2009. An overview of the Sustainability Strategy for Ontario’s Ministry of Transportation (EBR Registry # 010-7889) – The Ministry of the Transportation is seeking public comments on its proposed sustainability strategy. Comments will be accepted until November 20 2009. From Waste to Worth: The Role of Waste Diversion in the Green Economy, A Minister's Report on the Review of Ontario's Waste Diversion Act, 2002 (EBR Registry # 010-8164) – Ontario's Ministry of the Environment is proposing policy changes to its waste management framework that are intended to: Achieve greater diversion and deliver environmental and economic outcomes; Make producers responsible for their products and packaging; Provide the public with more opportunities to recycle more materials; and Place the province among leading jurisdictions in waste diversion. Comments on the Minister's report will be accepted until January 11 2010. Proposed Growth Plan for Northern Ontario (EBR Registry # 010-8128) – The Ministry of Energy is seeking public comment on a proposed Growth Plan for Northern Ontario, under the Places to Grow Act. The Act mandates that Growth Plans take into account communities, the environment, and the economy. The proposed Growth Plan would bring research, job training, and new infrastructure to the north. Comments will be accepted until February 1 2010. Wednesday December 2, 7pm – Earth Keepers. This feature documentary by Sylvie Van Brabant introduces Mikael Rioux, a young Québécois activist who founded Échofête, Quebec’s first environmental festival. Spurred by his passionate concern for the world his son will inherit, Rioux goes on a global quest to meet 7 visionaries with concrete solutions to ecological problems. Together, they offer a survival guide for our planet and a journey back to hope. The screening will be held at NFB Mediatheque, 150 John St. Toronto, ON. On May 4, 2009 Abena Amoako-Tuffour joined CIELAP as a research assistant. Her four-month internship was the final requirement for her Masters in Environment and Sustainability (MES) program at the University of Western Ontario (UWO). UWO’s MES Program focuses on four areas relating to the environment: ecosystem health, sustainable business, engineering solutions, and planning and management. These courses are offered alongside the Foundations of Sustainability course. The MES program prepares graduates for interdisciplinary work in scientific, business, industrial and policy sectors. The program requires a co-op placement for students to employ the skills and knowledge gained in the classroom. As a CIELAP intern, Abena learned much about professional writing for a policy audience as well as for the general public. She also learned about NGO governance, emerging environmental issues (e.g. barriers to local food, animal growth promoters, electronic waste) and about how to create and influence policy. Abena appreciated the professional, down-to-earth and forward-thinking environment that she found herself in at CIELAP and admires the spectrum of stakeholders with whom CIELAP engages. She feels her time at CIELAP prepared her for a future in environmental policy and public engagement at a local and, eventually, an international level.